Sometimes we all need a little WOW! 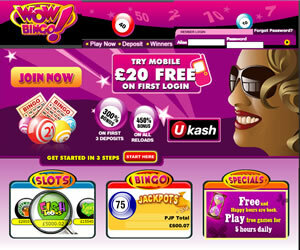 in our lives and that's exactly what's on offer when you sign up to play online at Wow Bingo. Or at least that's what it seems until you read the small print. From the moment you hit the stylised black and pink homepage, it's clear that the team behind Wow Bingo want you to be impressed, and first impressions are certainly good. 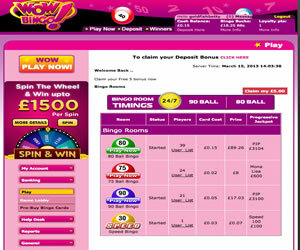 Wow Bingo is brought to you using the Cozy Games software package, and signing up for a new account is really simple. It is part of the Best Bingo Network, so if you're already signed up with one site on the network, you may need to register different details. The registration process is all in one screen, you don't have to register your payment details immediately and the entire process takes less than a minute from beginning to end. When you do sign up for a new account at Wow Bingo, make sure you take note of the special sign up promotions as there are all sorts of no deposit bonuses and cash match bonuses to be claimed regularly. Also, to make things as simple as possible, Wow Bingo offer a range of payment options to suit everyone, all the usual debit and credit cards are acceptable, but you can also use various other methods including UKash. You should take note of some of the issues we found when reviewing this bingo product; firstly the no deposit bonus is not instantly in your account. You have to validate your account and then complete your profile to receive the full advertised bonus. Secondly, take a look at the minimum withdrawal amount and the rules surrounding withdrawals taking particular note of the caps placed on withdrawals and how often they are processed. Wow Bingo, like many other brands using the Cozy Games software don't make it easy to get your cash if you are a winner. Once you're ready to play, there's plenty to be getting on with as Wow Bingo offer a lot of choice. There's 90-ball, 80-ball, 75-ball and 30-ball speed bingo available to play, giving you a plethora of games to choose from. And it isn't just the bingo, there's also a selection of mini-games, slots, instant win games and online casino games to be played, both from within the game page and from the lobby. The game screens are simple and easy to navigate, with the entire thing offering the Wow factor with a bright green background. 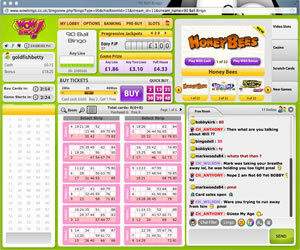 Tickets take centre stage and are clear and easy to see, while there is a chat box, and plenty of chat options to the right of the screen. Pay attention to what is going on in chat and you'll find friendly chat hosts (although more than a little finger happy using the smileys) who aim to make this site a great place to play bingo and chat. Game details and game options are all at the top of the screen and there is a selection of integrated side games, slots and instant wins to play while you're there. If you like big jackpots, the slots offer plenty of these and there are big progressives up for grabs in many of the rooms too. The progressives grow and grow until someone calls House! in the right amount of calls and the jackpots are known to grow to thousands of pounds. If you like a good range of games, plenty of bingo and lots of chat then you should find yourself at home at this online site, and with the chance of some big wins, there's plenty to keep you coming back time and time again! However, if you want to be able to withdraw winnings quickly and with minimal fuss, move along because Wow Bingo isn't the site for you! 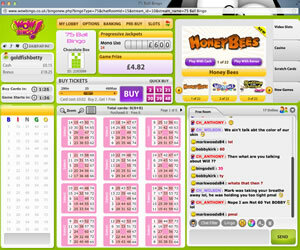 Wow Bingo offers four different types of bingo game at their site. You are offered 30, 75, 80 and 90 ball in a number of rooms, some of which have access restricted to those who have made a deposit. Wagering requirements with Wow Bingo are variable dependent on both the games you are playing and the bonus option you have chosen. You can find all the details of these in the FAQ section of the site under the Withdrawal Rules section. We strongly recommend that you read the withdrawal section thoroughly before making a deposit with the site.